11:00- Lights Out – No Students are allowed in the hallways at this time. ALL ADULTS ASSEMBLE IN THE HALLWAYS. 6:30- Wake up. Clean up sleeping areas and get ready for church. PLEASE WEAR THE ANNOUNCED SHIRT SO THE HOST CONGREGATION CAN IDENTIFY EACH OF YOU. 7:00- Morning devotion and announcements. 8:00- Leave in work crews for church. 12:00- Lunch at host church. After lunch, tour the work sites and take the before pictures. 3:00- Return to California Middle School. Showers will be open. Snack Shack is open. 5:00- Informational meeting in the cafeteria. 6:15- Assemble for group picture. 7:00- Community worship at United Church of Christ in California, MO. NO STUDENTS ARE ALLOWED IN THE HALLWAYS AT THIS TIME. ADULTS SHOULD SUPERVISE IN THE HALLWAYS. 7:00– Meet in cafeteria for morning devotions and announcements. THIS IS REQUIRED BY ALL! 8:00– Leave for work sites in crews. Crew chats should begin each day at work sites. 3:30– Leave work sites and return to the school for showers and free time. The snack shack will be open. 6:15– Adults Information meeting in cafeteria after supper. 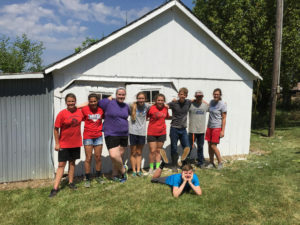 Youth should report to United Church of Christ in California, MO. 10:00– Free time. The snack shack will be open. Students may not go outside unsupervised any time. 11:00– Lights out. Please be respectful. All adults supervising hallways at this time. No students may be in the hallways after 11:00. 6:30- Wake Up, showers open in school only. 8:00- Clean up responsibilities will be posted by youth group.